The peopleMaps Compass provides a visual illustration of a personality’s behaviour in particular circumstances. We have created it to show you at a glance the likely behaviour of the person whose report you are reading. Not all of the personality topics have an associated Compass yet, but we’re adding new ones all the time. the green label underneath the star which in this case is “DELEGATE” – this label tells you what the compass is measuring. the pink labels to the extreme left and right of the compass which in this case are “Relinquish” and “Interfere“. These labels indicate extreme reactions of the personality type we are reporting on. the “OPTIMUM” vertical centre line indicates when someone is naturally good at something; in this case ‘Delegating’. The following is an example of “Delegate“. It essentially illustrates an individual’s natural ability at delegating. The nearer you are to the “Optimum” central line the better. 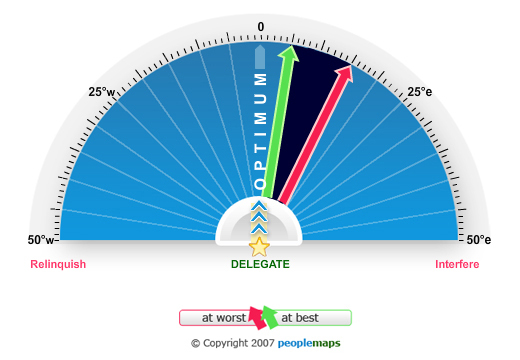 This particular Compass reading represents someone who naturally is a good delegator – where the green “at best” arrow is near the “Optimum” central line. However the world doesn’t simply divide into good delegators and bad delegators – and the Compass reveals even more detail. You can be a poor natural delegator because you ‘relinquish’ tasks or because you ‘interfere’ too much. It is important to understand which side of the “Optimum” line an individual is located. Remember, the closer the green “at best” arrow is – and that can be either on the Western or Eastern half of the Compass – to the “Optimum“, the better. By using the two arrows PeopleMaps addresses the mobility of an individual’s personality. This mobility is represented by the distance between the green “at best” arrow and the red “at worst” arrow. 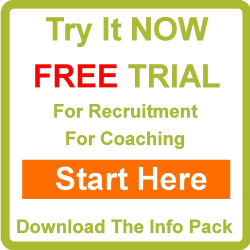 In this example the arrows are pretty close – the individual tends to interfere a little on bad days but is generally consistent in how they go about delegating. Had the arrows been further apart then the mobility would be high, indicating that some days they would be very good at delegating and some days far too interfering. This means their behaviour would be less predictable. People’s behaviour does vary day to day, and it is useful to know the extent to which it varies on each aspect of personality, in this case “Delegate“. The PeopleMaps Compass from Dream Job on Vimeo.